Needle-Mover Growth Series Part 1: Core Disruption - Vanguard Marketing International, Inc. The simplest and lowest-risk product releases are updates to existing offerings that represent continuous improvement. Usually this means the addition of new features and functions, often guided by customer input. Updates may well be important for maintaining the core business. But in a higher-order view, such incremental improvements represent a holding pattern, where each competitor more or less maintains its position in the market. The best way to break out of this holding pattern is to move past continuous improvements into a next-generation product, one that is enabled by, or built on, a new technology. The goal is to create needle-mover growth by creating a disruptive innovation. Growth is a core competency of VMI. We have been working on these challenges for clients for over two decades, and we have found that core disruption is one of the best methods for achieving low-risk, needle-mover growth. We begin the process by looking at a market and defining an emerging high impact need/problem. Sounds hard but it just takes focus. We typically take problems for granted “that’s just the way things are.” Identifying a great problem means stopping to think and analyze. It means applying real effort to reach an understanding and a path forward. With the problem defined and validated, we move on to explore what a great disruptive solution would look like and if we can deliver it. With the problem and conceptual solution defined, we are able to analyze the gap between where we are today and what we would need to bridge that gap. Sometimes, we have found that these gaps can be filled by changing the business model, applying a capability, or a technology that would produce our disruptive solution. For example, access to a disruptive technology could lead to a merger or acquisition, or even to a partnership that we would not otherwise have considered. In recent years, artificial intelligence (AI) has been embraced as the new disruptive technology of choice. At its most basic, AI is concerned with getting computers to do tasks that would normally require human intervention or intelligence. It is now driving a wide range of products across all sectors, think about smart buildings and everything in them being attached to the IoT and AI enabled,with exponentially more on the way. For example, in our 2018 CES paper, we reported on SAMSUNG’s 8K AI Technology built into its 85-inch TV. Based on machine learning, the technology analyzes TV content and automatically upscales low-resolution 720p and 1080p images into 8K picture quality. Where else might this type of technology prove to be revolutionary and disruptive? Anyone who works with images may be less inclined to frequently upgrade their cameras or sensors if their images can be rendered in 8K with AI software. But what about images that have been archived by individuals or agencies? When upgraded to 8K, these images might offer greater forensic opportunities and/or more usable intelligent databases for future learning, prediction and recommendations. And how important is high-resolution on costly satellite cameras, if images can be accurately upgraded once they are delivered? Extremely. Also highlighted in our CES paper is the NEC NeoFace Recognition Wall, which claims to be the fastest and most accurate biometric facial recognition under all conditions. The system can correctly recognize faces up to a 45-degree angle from a camera and can do so within 0.2 to .5 seconds existing video surveillance systems. NEC’s stated intent is to disrupt the market for identification badges. Beyond affecting the companies that produce badge gear, what would be the impact on businesses who rely on secure identification without badges, badge readers, or deal with lost badges? The success of a product like the NeoFace Recognition Wall would be just the beginning of a massive disruption in the access/access denial market. In fact, that is only one of its many potential market applications. 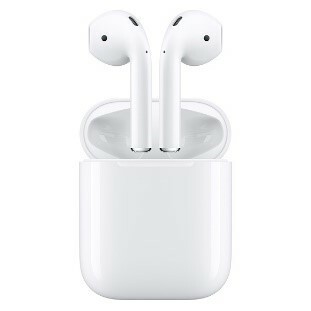 AI is even used in Apple AirPods earbuds with the iPhone and their potential for disruption is astounding. Consider these applications: instantaneous translation of any language in real time, the ability to “learn” the audio environment, while shutting out background noise and even specific voices. A simple, personalized system that could support all hearing functions, including augmentation for those with hearing loss. Hearing aids already take advantage of Bluetooth to connect with iPhone apps and ear buds. But what if hearing aids themselves become an app — at app prices, not hearing aid prices? Such “hearables” have the potential to completely disrupt and possibly obliterate the hearing aid industry. 1. AI should be included in practically every growth and disruption strategy. If it isn’t currently, strongly consider upgrading. 2. Any company that does not have AI capabilities should start developing those capabilities at a pace that makes sense. The understanding of AI and its application within the enterprise and in the market will become a kay differential advantage. It will not be outsourced. The implementation of AI represents a long-term opportunity, and in many ways it is like the analog-to-digital transition: it took decades to roll out, but the disruption was broad and absolute. Some companies are natural innovators and will grab onto the AI trend early. Some will wait for a critical point in time to act strategically; others will wait until it’s too late. Those who are enablers of the disruption will achieve needle-mover growth. Everyone else will also watch the needle move, but it will be headed in the wrong direction.